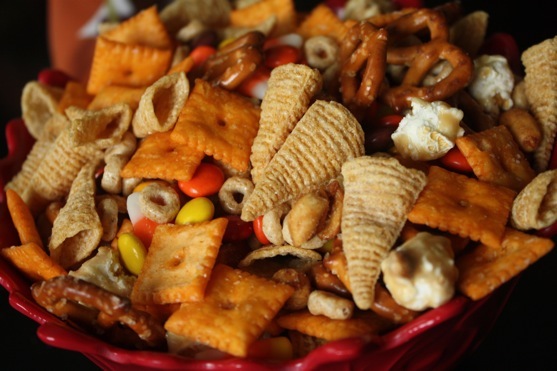 I love a good seasonal snack mix. They are so much fun! I’ve done one for Valentine’s Day and the Thanksgiving Blessings Mix, and I’m sure I’ll whip one up for Christmas this year too. This snack mix, inspired by the Halloween Snack Mix at Munchkin Munchies (discovered on Pinterest) was just what I was looking for: something that didn’t require much time to make. This is the easiest kind of snack mix to make because you just throw together ingredients with no baking and no measuring. This is somewhat similar to the Thanksgiving Blessings Mix I made last year, with a few extra Halloween-y elements thrown in and without the symbolism of the Thanksgiving mix. This recipe (if you can even call it that) is super flexible, stores well, and would be great for Halloween parties and gifting. What more could you ask for?! Just get your biggest bowl and throw it all together. Want more sweet stuff? Want more salty stuff? Adjust to your particular tastes! Couldn’t be easier.